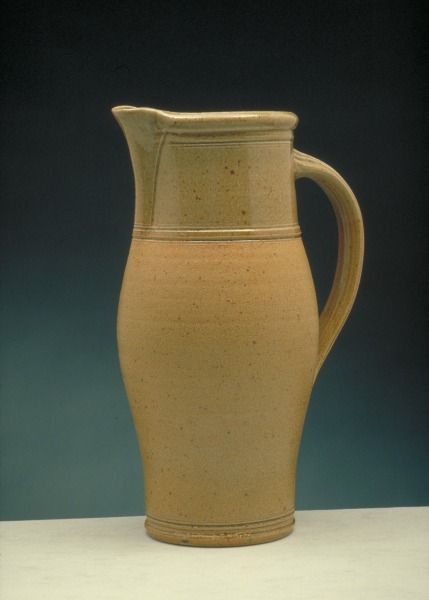 Stoneware jug with a thin green/brown glaze on the outside, over a thicker white/green glaze on the rim and ribbed handle. Stoneware. Thrown on a kick-wheel. Thin green/brown glaze on outside over thicker white/green glaze over rim and handle. Handle ribbed with finger nail. Oil fired to 1280 - 1300 deg. C in reduction atmosphere. Part of standard range of domestic pottery developed since 1975. Jugs in 5 sizes, Extra Large to cream size.